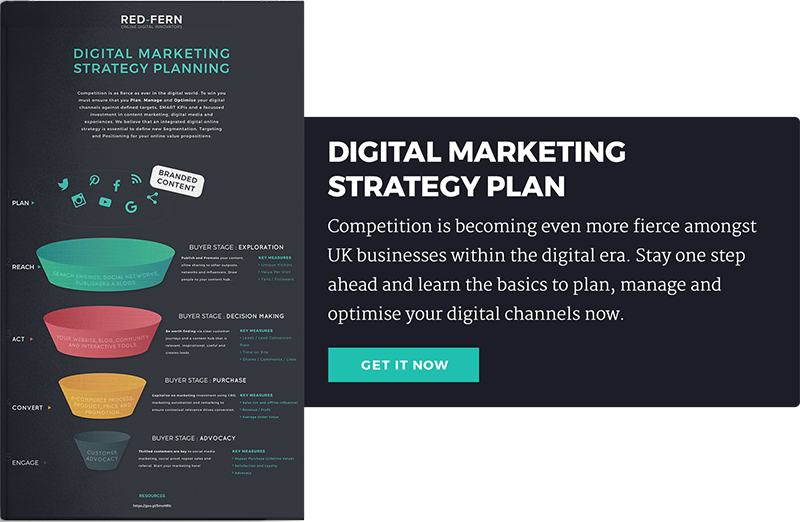 There are a wealth of FREE digital marketing tools to help businesses stand head-and-shoulders above the competition. From web analysis to general productivity, we list 20 amazing digital marketing tools and techniques for 2018. The go-to guide for checking spelling or grammatical errors. Grammarly is a lifesaver when you can’t decide if it's ‘programme’ or ‘program.’ It's vital to create clear and concise content for readers and search engines. Grammarly helps you create polished content appealing to all your buyer personas. Available as a free digital marketing tool, as a browser extension or integrated app. Grammarly can be a godsend when writing content of any description. The Hemmingway App flags all those niggling grammatical, syntax and style issues with your copy, making it easy to digest. Regular use will not only improve the quality of your content, but your conversion rates. Like BlogAbout, Hubspot’s Blog Topic Generator is a great when you’re scratching your head for blog ideas. Use your primary keyword and associated search terms. Blog Topic Generator will suggest five blog titles, selected for relevancy and engagement. Creating relevant engaging topics that your buyer personas want to read is key to grabbing their attention. If you’re intent on doing your own content marketing, WriteWell is essential. Offering a comprehensive appraisal of your content, WriteWell does more than spelling and grammar. Providing suggestions that polish the writing, WriteWell manages all the words on the page. Allowing even the most novice content marketer the ability to create impacting copy. The most important line of any email is the subject line. When sending any email, you want to make sure that people read it. How often have you ignored an email with an uninspired, generic subject line? It can be difficult to pinpoint what makes a good subject line. SubjectLine is a free digital marketing tool that examines the subject line and gives it a potential performance rating. Not only that, but SubjectLine tells you how to improve it! When all’s said and done, what’s most important is how your website is performing. Hubspot’s Website Grader will answer that. Analysing all the factors required for a successful website. Including SEO, mobile optimisation and security. Website Grader provides you with a ranking score, allowing you to identify any tweaks, or even if a complete re-design is required. All you need do is input your URL. Content needs to draw attention, but you don’t need to be a design whizz to engage and compel your audience. Boosting the visual appeal of your website is easy with Canva. This simple design tool is brimming with cool design features.Its drag-and-drop style means you can create call-to-actions, imagery and infographics. Amongst a wealth of other content that’s guaranteed to draw attention. Want to understand where your website visitors spend their time? Hotjar is the perfect digital marketing tool. Hotjar reviews different aspects of your website. It features different tools essential to gage website performance. Including heatmaps, form analysis and sales funnel data.This is the tool for businesses who want to boost conversion rates and turn browsers into buyers. This is our personal favourite and we install it on all websites we're developing marketing strategies with. Finding the right stock photos for your website can be an impossible task. Good images complement every other aspect on the page. Bad images randomly placed on a page stick out like a sore thumb. Content is king. For any business to leapfrog the competition their content needs to be better. BuzzSumo is a content performance analysis tool. It tells you the most popular content on any given topic, and who’s sharing it. By entering a keyword, you can see the articles that have generated the most buzz on social media. This is brilliant because it allows businesses to see what type of content performs best for their specific personas – and reach out to influencers to boost the credibility of their business online. We’d all like to be more productive. Sometimes it feels as though the day has passed by in a whirlwind. RescueTime is a great resource for identifying the amount of time we’ve spent on certain activities throughout the day. There are side-by-side comparisons of your most and least productive tasks, which are outlined in geographical data for easy understanding. RescueTime enables you to be more efficient in your daily activities. As an organisational and time management digital marketing tool, you can’t do much better. Mobile devices are integral to our working lives. The need to keep organised cross all your devices has never been more important. Evernote is a standard notes app that will benefit all business owners. Allowing you to sync content to all your devices, including remainders and voicemails. Evernote acts as an organiser, once you start using it, you’ll wonder how you ever lived without it. We’ve all had the feeling of logging into one of our online accounts, only to draw a blank when thinking of our password. Passpack means you’ll never forget a password again by allowing you to store and share a wealth of account login information. This highly-secure password manager is the easiest way to store and share account login information. With a plethora of resource data, DeepCrawl helps businesses understand website performance. From SEO to speed, site structure and identifying low ranked pages, the tool identifies areas of website improvement. Test each change before it's implemented. DeepCrawl allows you to make subtle or significant changes to boost website performance. The On-Page Optimisation Tool provides you with a snapshot of the most important factors driving your website’s search engine optimisation. From keywords to meta descriptions, internal and external links. This digital marketing tool provides you with the complete reasoning behind the where and why of your website index. Interested in discovering how your website performs against the competition? Get access to comprehensive statistical data with SimilarWeb. All you need to do is enter your domain name and the tool will generate a graph comparing traffic numbers between you and your competitor’s website. Nibbler provides business owners with an in-depth analysis of their website. Factors everything from quality of code to social interest. Nibbler gives you a website score, complemented by a comprehensive report. Recommended fixes are also provided. This helps businesses owners understand web performance and how to improve it. Looking to simplify workflow and promote team collaboration? Look no further than Trello. The digital marketing tool creates customised boards which organise and prioritise workloads. With a multiple-user interface, Trello's users work together, adding attachments or reviewing tasks. Encouraging transparency and collaboration, Trello is ideal when working on large-scale, complicated projects. Are you new to Twitter social media marketing? If so, SocialQuant is what you need. With advanced algorithms, SocialQuant scans all Twitter conversations and selects the best accounts to follow, based on a set of keywords provided by the user. This is a great way of connecting with your buyer personas. Save Publishing is a browser extension tool. It offers a quick way of social media publishing, without sacrificing on post quality. The browser extension tool scans articles and highlights tweetable sentences within the content. By using the browser, businesses can tweet relevant and engaging content in a flash! Editors note: This post has been revamped and updated for 2018. At Red-Fern, we love keeping our content accurate, it ensures our articles are relevant and fresh! There you have it. 20 digital marketing tools and techniques to help your business take flight. So, how many are you using?